Nursery (Infants-3 years): Sunday school begins at 9:30 AM. Nursery Volunteers are also available during the worship service. Please label drinks, snacks and diaper bags. Thank you! 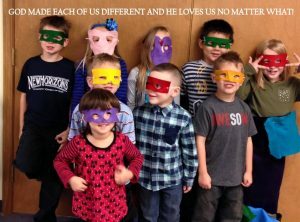 Sunday School: PreK thru 2nd Grade Children & 3rd – 5th Grade Children have Sunday school at 9:30am. Classes meet together to study God’s word and how to apply its principles to their life. Children’s Church (4 years-5thgrade): Children participate in an age-appropriate Bible lesson and activities during Sunday morning worship. Children are dismissed prior to the message to attend Big House. A children’s sermon is provided in lieu of Big House on the first Sunday of each month. An exciting Wednesday night program is coming soon!